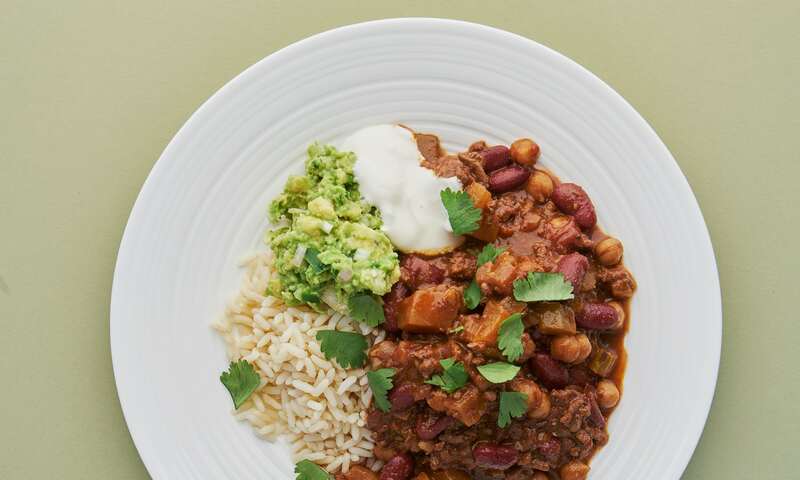 In Texas, chilli con carne recipes are furtively guarded for the annual contests that take place throughout the state, but Thomasina Miers has no need for such secrecy. Just throw everything together, then wait, for a fun and delicious meal! Get all the ingredients chopped and measured first. Heat half the oil in a large casserole on a high heat. When it’s sizzling hot, add the beef, season generously with salt and pepper, and brown in the fat for about five minutes, breaking up any clumps of meat with a wooden spoon. When the meat has coloured nicely, transfer it to a bowl, add the rest of the oil and the butter to the pan, and turn down the heat to medium-high. Add the onions and celery, season and cook, stirring, for five minutes on a medium heat. Add the apple and garlic, and fry, stirring, for a few minutes more to soften the garlic. Stir in the spices, oregano, green chilli (if using) and the chipotle, and sweat gently, without colouring, for five to 10 minutes more, until the vegetables are soft.